P/O Setup stores information which allows you to tailor the Purchase Order and Receiving package to your specific needs. 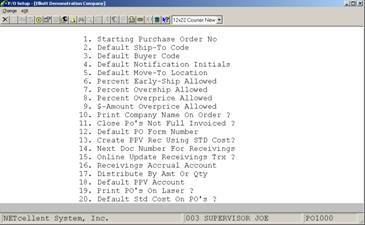 It includes such information as the starting purchase order number, various default values used throughout the package, how much deviation is allowed from the requested receipt date, the requested amount and the expected price, and whether the package should print the company name and address on purchase order forms and other pertinent information. The information in this file is used throughout the package, but it is particularly useful during the entry of orders and receivings and the printing of orders. For instance, in Purchase Order Processing, a Ship‑To destination must be specified for the order. Companies which have a single shipping address, or which have a central receiving warehouse where most merchandise is received, will find the availability of a default ship‑to code very valuable, since the operator will be able to select the shipping destination by simply pressing RETURN. In another example, if the operator enters an amount received that is greater than the amount ordered, and if this difference exceeds the variance allowed in P/O Setup, a message will display on the screen, warning the operator of the situation and suggesting that authorization be received before continuing. The operator may have selected the wrong order when assigning the receiving of the vendor may have simply over-shipped. Whatever the case turns out to be, the operator needs to be alerted to the fact that such a discrepancy is unacceptable. One of the P/O Setup fields is especially important in determining how receivings are handled. Flag #15, (Online Update Receivings Trx) controls whether receivings are recorded on-line or using batch processing. Batch processing requires the extra step of posting receivings transactions, but provides greater flexibility in terms of allowing distributions to multiple G/L accounts. It also gives you greater control by allowing you to print an edit list to verify and make corrections to transactions before they are posted. For more information on online and batch processing, refer to the application overview section of the Receivings Processing documentation. The data in P/O Setup can be used to improve or to establish criteria for acceptable variances. Since the data in this file affects programs throughout the package, you must take care to ensure that the data entered is correct and appropriate for your company. Enter the number of the next purchase order number to be used when purchase orders are entered. Enter the Ship‑To Code that the package should display as a default when purchase orders are entered through Purchase Order Processing. The code does not need to be on file at the time this field is entered, but for the default to function, you must ensure that the code is ultimately defined in the Ship‑To File Maintenance application. If there is a single receiving warehouse, you would enter here its Ship‑To Code. If there is more than one receivings location, enter the Ship‑To Code of the one that is most commonly used. You may leave this field blank to disregard the default capability. Enter the Buyer Code that the package should display as a default when purchase orders are entered, or leave the field blank to disregard the default capability. The code, if entered, need not be on file at this time, but you must be sure to enter it eventually, through the Buyer File Maintenance application, for the default feature to work. The notification initials are the initials of the person who should be notified when shipments of a particular item are received. The initials are entered for each line item on an order. When merchan­dise is received, the receivings personnel will check the line item against which the receiving will be logged, in order to determine who should be notified of the shipment. This field is displayed as the default, during the entry of line items on an order. Enter the initials of the person who most commonly receives the notification of shipments, or leave this field blank. The Move‑To Location is the area to which shipments are relayed after receipt. This location is specified for each line item on an order. Enter the descriptive abbreviation or code of the most common location to which merchandise is moved, following receipt, or leave this field blank. Vendors sometimes ship merchandise earlier than the request date on the order specified. Enter here the greatest percent early‑ship that the package will allow before warning the operator, who logs the receiving, that authorization is required to accept the shipment. This feature also serves to identify the case where the operator accidentally logs the receiving against the wrong purchase order. In order to enter a meaningful value here, you must understand how the value will be used. 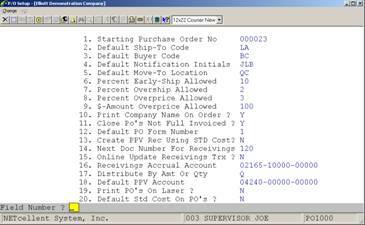 Programs that determine the percent early‑ship do so by computing the number of days between the purchase order's print date and the line item's request date. This is the "expected" number of days. They next compute the number of days between the order's print date and the actual receipt date. This is the actual number of days. Then they sub­tract the actual days from the expected days to get the number of days early and divide the early days by the expected days to get the percent early. It is this value that is compared to the allowable percent early‑ship to determine if the shipment is too early. Just as vendors occasionally ship too early, they sometimes ship more than was requested. They might also consolidate orders in a shipment or specify the wrong purchase order number on the shipping documents, thereby causing it to appear that too much was shipped. Enter here the percent over-shipment that is allowable before the package warns the operator that authorization is required to continue processing the receiving. When a purchase order is issued, a price is usually specified on the order for each line item. When the vendor sends the invoice for the goods that were shipped, a unit price will also, of course, be specified. Enter here the percentage difference that is allowed between the ordered price and the invoiced price before the package warns the operator that authorization is required to continue processing the invoice. If the percent overprice allowed (entered above) causes the actual dollar value of the overprice for a single item to become too large, much of the benefit of the feature is lost. You can specify here the maximum dollar value of the over‑price that is allowed before a warning message displays. The percent overprice allowance is most valuable for lower‑priced items. The dollar‑value overprice allowance comes into play for expensive items where the percent overprice is actually still acceptable. 10. Print Company Name On Order ? Answer Y if your purchase order forms do not have your company name pre‑printed on them. The package will print this infor­mation on each order form when purchase orders are printed. Answer N if the forms have the name and address pre‑printed on them. 11. Close Po's Not Full Invoiced ? Enter whether or not you will allow purchase orders to be closed when fully received but not fully invoiced in A/P. Enter the default form number you want to use when printing purchase orders. Default is 1. If this field is set to Y, the PPV records will be created in A/P using inventory standard cost. This will occur only if the Standard Cost is not set to zero in the inventory master file. If the Standard Cost is set to zero in the inventory master file or this flag is set to N, the PPV records will be created using the actual cost. Enter the next document number to be used for recording receivings transactions in the Receivings Processing application if posting type receivings processing is being used. If the F1 key is pressed while on the Doc number field in that application, the program will read the document number from this field and then increment it by one. If a document number is user-entered in Receivings Processing this field will not be changed. 15. Online Update Receivings Trx ? Enter Y to select online receivings processing. If this is selected, inventory levels will be updated immediately when receivings are recorded. Enter N to select batch receivings processing. If this option is selected, receivings will be posted via the Post Receivings Transactions application; allowing for distributions to G/L accounts. IMPORTANT: To avoid errors in distributions, this field should be set the same as field #24 (Online Update Inventory Trx ?) in I/M Setup. An account number in the standard format. Enter the number of the account to be used to hold the value of received inventory if batch processing is being used. If field #15 is set to N, this account must be entered before receivings can be entered in the Receivings Processing application. When receivings distributions are created, this account will be credited and the distribution accounts will be debited. When the appropriate invoice is entered in the A/P Transaction Processing application, this account will be debited and the A/P account will be credited. In order for the Receivings Processing application to recognize the number entered here as a valid account, it must be on file in the I/M Account File. Enter A to distribute transactions in the Receivings Processing application by dollar amount. Enter Q to distribute receivings by item quantity. If you are using the Landed Cost feature, this flag must be set to “Q”. A. Field # 15, (Online Update Receivings Trx ? ), in P/O Setup is set to N for batch processing. B. Field # 1 (Inventory Cost Method) in I/M Setup is set to S for standard costing. C. The item being received does not have a Purchase Price Variance account recorded in I/M's Material Cost Type/Loc File Maintenance application. If all three of the above criteria are met, the default PPV account is used to record any difference between an item's standard cost and the actual cost entered in the Receivings Processing application. Enter Y if you will be printing Purchase Orders on a laser printer. Enter N for all other types of printers. “Y” to use standard cost.